A trigonometry textbook that treats the solution of triangles quite fully and elaborates analytical trigonometry. It covers angles, trigonometric functions, inverse functions, trigonometric equations and identities, triangles, spherical trigonometry. by Henry Bedingfield Goodwin - Longmans, Green, and Co. This book was intended to serve as an introduction to the study of Navigation and Nautical Astronomy for the junior officers under training in H.M. Fleet. 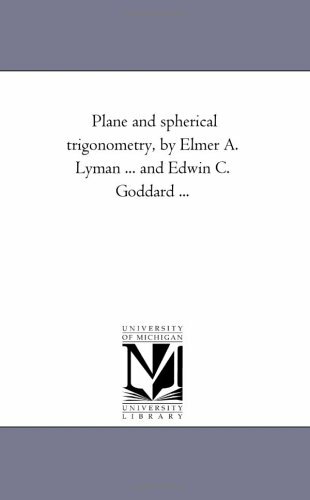 The text plane trigonometry, spherical trigonometry, and the examples in the use of logarithms. A comprehensive book on trigonometry. From the table of contents: Trigonometry and Right Angles; Circular Functions; Trigonometric Identities; Inverse Functions and Trigonometric Equations; Triangles and Vectors; Polar Equations and Complex Numbers. Dr. Stitz and Dr. Zeager co-wrote this high-quality textbook that is within reach and accessible to the average college student. A quick glance at the table of contents shows that all the major topics of a college trigonometry course are included.